Enchantment Sedona with its most coveted prize. The Best Destination Spa In The World! Jump To These Related Pages? Following is an in-depth look at the kind of Aquawork that can be found at Mii Amo Spa of Enchantment Sedona. Utilizing the power of water, here are ancient and well known modern ways to be soothed, cleansed, and energetically open. Enchantment Resort Mii Amo Spa experts say, "the freedom from gravity allows flexibility of the spine that is rarely achieved through traditional massage therapies." We say, YES. And warm water also just feels really good. Pair this with an expert Enchantment Sedona treatment, and you'll be floating in spa heaven. Flower essenses, meditation, sunlight. 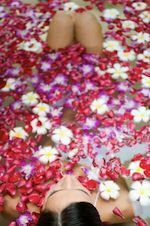 Enjoy a warm aromatic flower bath while your scalp and hands are massaged. Subtle energy balancing techniques will restore balance. Profoundly relaxing, the Enchantment Resort hydrotherapy tub treats the entire body. You'll be suspended and feel like you're free from gravity. This is an especially good choice to pair with a post-bath massage. First, a full-body honey scrub to exfoliate. Then, a divine dip in a warm bath filled, yes, with milk and honey. It's followed either by a light massage, or, you can arrange the 90 minute session to enjoy a half-hour post-bath massage treatment. Enjoy the gentle and expert touch of a therapist while you are suspended. Release stress and old patterns. Relaxing and perhaps, healing. Joint movement, massage, Shiatsu, and muscle stretching. You are the reason SedonaHappy.com exists, so kindly accept our ATTITUDE of GRATITUDE for your interest in this site, in our stand out Sedona spas,and in our beloved hometown. Click here to return to the Mii Amo Spa Menu. Go to the SEDONA SPAS MAIN PAGE? Click here. To go to the HOME page from this Mii Amo Spa at Enchantment Sedona page, click here.